Bonus features include interview video clips, a music video, and behind-the-scenes footage filmed during the production of A Great Awakening, a feature-length documentary scheduled for completion in 2010. 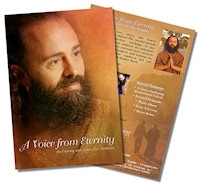 A Voice from Eternity is now available in PAL and NTSC formats at www.prasadthestore.org and www.amazon.com. A Voice for Eternity will be featured during a series of events in Los Angeles and Orange County during 2009. The Producer and Director, as well as Louix Dor Dempriey’s Personal Assistant, will be at these events. Louix Dor Dempriey is a spiritual Master who has come into this world to help people restore their inherent divinity and live as unconditional love. With grace and humor, He imparts timeless wisdom in contemporary, practical teachings, making self-mastery and true, inner peace attainable for all—for His life models both the journey and the victory of God-realization. The Louix Dor Dempriey Foundation, a non-profit educational organization, was established in 2007 to share Louix’s teachings and humanitarian programs with the world. Louix lives at Prema Drala Ashram in Laguna Hills, California, and has ashrams and study groups around the world. For more information, visit: www.Louix.org. A Great Awakening – A Documentary on Human Transformation is the story of one man’s journey into the miraculous, love-filled world of Louix Dor Dempriey, a spiritual Master with devotees all over the globe. Unwittingly, he finds himself on a spellbinding journey into the very essence of human existence. Never could he anticipate the profound personal transformation and wondrous adventure that he was about to experience…. Filmed on location on four continents, A Great Awakening is a message of hope, a quest for unconditional love, and a modern look at ancient wisdom that has been taught by masters, mystics, and sages throughout history. For more information about A Voice from Eternity, and A Great Awakening, please visit contact the Producer, Zimmaron Zsido: zimmaron@Louix.org; (949) 636-5852.